Providing house clearance services in Surrey, Sussex and London. Our clients include homeowners, solicitors and property management companies. Free, no obligation quotations. HCC offer a comprehensive commercial site clearance service for retail, office and industrial clients in Surrey, Sussex and London. 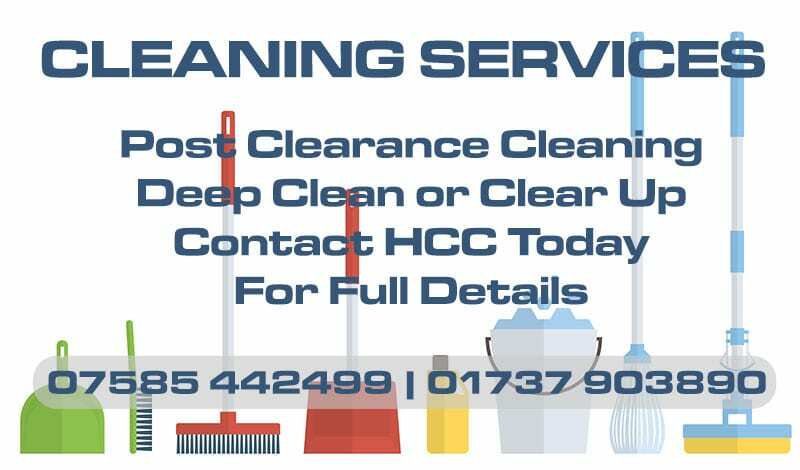 House clearances in Surrey, Sussex and London from HCC – House and Commercial Clearances. We offer a comprehensive commercial and house clearance service, removing all unwanted furniture, electrical goods, general household items, outdoor furniture and garden electricals such as lawnmowers and trimmers. Our commercial clearances include end of lease clearances and office refurbishments. We are happy to give estimates for work over the phone. Alternatively click the button and you will be taken to our contact page where you can submit a form or send us an email. We look forward to hearing from you! House clearances Surrey, Sussex and London, for small and large properties. Commercial and office clearances in Surrey, Sussex and London, at convenient times! Garden clearance all sizes considered in Surrey, Sussex and London. Probate valuations Surrey, Sussex, London, for solicitors and executors, sympathetically considered. Complete clean of your property or premises once it is cleared. Hassle free clearance of your garage and hard-to-get-to basement. We can clear your storage units, and help with a downsize move. Safe removal of your fridges and freezers, environmentally friendly. HCC, House and Commercial Clearances have a clearance team near you in Surrey, Sussex and London. Our comprehensive clearance services provide everything you need for a swift, hassle free and affordable clearance of your property. HCC have over 20 years experience in the property clearance industry. From humble beginnings in South London, we have built our company on the foundations of fair pricing and honesty. We now work with a vast range of clients on properties of all shapes and sizes. If our are looking for a house clearance company in Surrey or London then please call us. Our fully trained and hardworking crew will always endeavour to complete every house clearance in the fastest possible time, with the minimum inconvenience to our client. We are fully insured and will always repeat the property we are clearing. We clear all requested furniture, junk and rubbish from anywhere in your home. Reception rooms and bedrooms, garages, basements and outhouses. House and Commercial Clearance offer free, no obligation valuations for probate and free quotations on all clearances. In some instances we will even pay you if there is a residual value to the goods being removed.